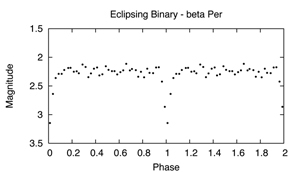 There are two kinds of variable stars: intrinsic, in which variation is due to physical changes in the star or stellar system, and extrinsic, in which variability is due to the eclipse of one star by another or the effect of stellar rotation. Variable stars are frequently divided into five main classes: the intrinsic pulsating, cataclysmic, and eruptive variables, and the extrinsic eclipsing binary and rotating stars. Generally, long period and semiregular pulsating variables are recommended for beginners to observe. These stars have a wide range of variation. Also, they are sufficiently numerous that many of them are found close to bright stars, which is very helpful when it comes to locating them. Pulsating variables are stars that show periodic expansion and contraction of their surface layers. Pulsations may be radial or non-radial. A radially pulsating star remains spherical in shape, while a star experiencing non-radial pulsations may deviate from a sphere periodically. The following types of pulsating variables may be distinguished by the pulsation period, the mass and evolutionary status of the star, and the characteristics of their pulsations. 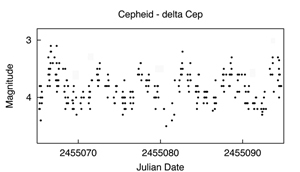 Cepheids – Cepheid variables pulsate with periods from 1 to 70 days, with light variations from 0.1 to 2 magnitudes. These massive stars have high luminosity and are of F spectral class at maximum, and G to K at minimum. The later the spectral class of a Cepheid, the longer is its period. Cepheids obey the period-luminosity relationship. 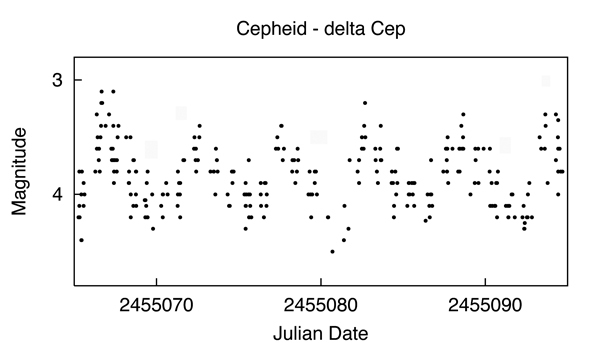 Cepheid variables may be good candidates for student projects because they are bright and have short periods. 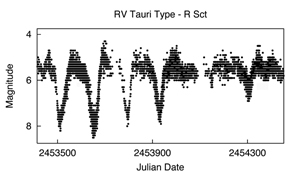 RR Lyrae stars – These are short-period (.05 to 1.2 days), pulsating, white giant stars, usually of spectral class A. They are older and less massive than Cepheids. 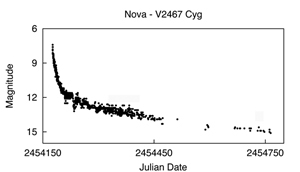 The amplitude of variation of RR Lyrae stars is generally from 0.3 to 2 magnitudes. 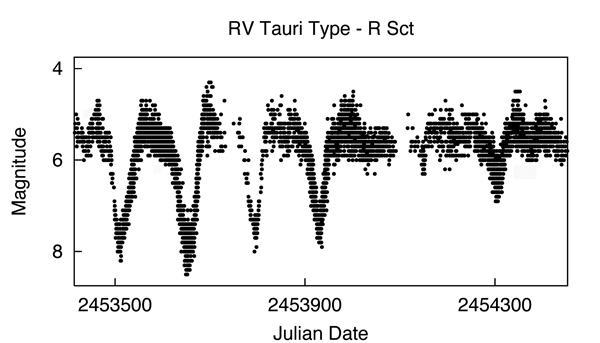 RV Tauri stars – These are yellow supergiants having a characteristic light variation with alternating deep and shallow minima. Their periods, defined as the interval between two deep minima, range from 30 to 150 days. The light variation may be as much as 3 magnitudes. 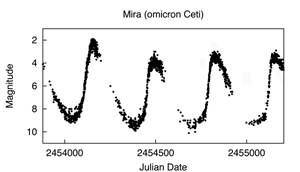 Some of these stars show long-term cyclic variations from hundreds to thousands of days. 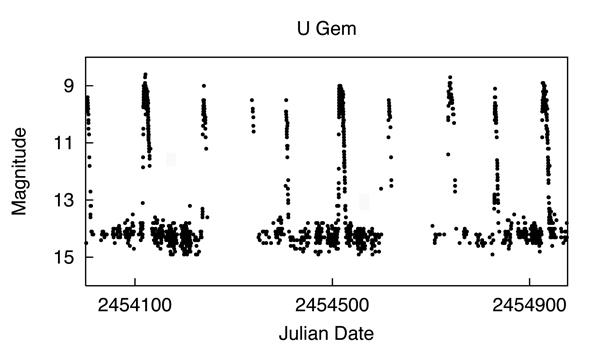 Generally, the spectral class ranges from G to K.
Long Period Variables– Long Period Variables (LPVs) are pulsating red giants or supergiants with periods ranging from 30-1000 days. They are usually of spectral type M, R, C or N. There are two subclasses; Mira and Semiregular. 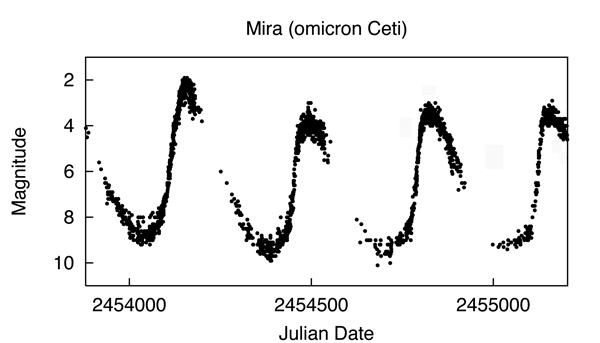 Mira – These periodic red giant variables vary with periods ranging from 80 to 1000 days and visual light variations of more than 2.5 magnitudes. Semiregular – These are giants and supergiants showing appreciable periodicity accompanied by intervals of semiregular or irregular light variation. 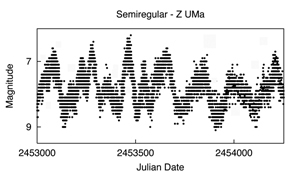 Their periods range from 30 to 1000 days, generally with amplitude variations of less than 2.5 magnitudes. Irregular variables – These stars, which include the majority of red giants, are pulsating variables. As the name implies, these stars show luminosity changes with either no periodicity or with a very slight periodicity. Cataclysmic variables as the name implies, are stars which have occasional violent outbursts caused by thermonuclear processes either in their surface layers or deep within their interiors. The majority of these variables are close binary systems, their components having strong mutual influence on the evolution of each star. It is often observed that the hot dwarf component of the system is surrounded by an accretion disk formed by matter lost by the other, cooler, and more extended component. Hubble Space Telescope image showing Eta Carinae and the bipolar Homunculus Nebula which surrounds the star. The Homunculus was partly created in an eruption of Eta Carinae, the light from which reached Earth in 1843. 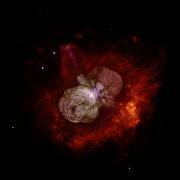 Eta Carinae itself appears as the white patch near the center of the image, where the 2 lobes of the Homunculus touch. Supernovae – These massive stars show sudden, dramatic, and final magnitude increases of 20 magnitudes or more, as a result of a catastrophic stellar explosion. Novae – These close binary systems consist of an accreting white dwarf as a primary and a low-mass main sequence star (a little cooler than the Sun) as the secondary star. Explosive nuclear burning of the surface of the white dwarf, from accumulated material from the secondary, causes the system to brighten 7 to 16 magnitudes in a matter of 1 to several hundred days. 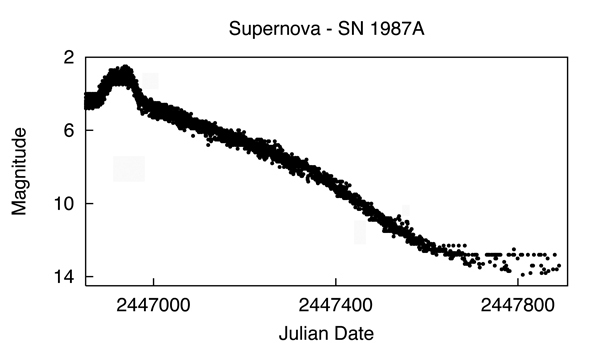 After the outburst, the star fades slowly to the initial brightness over several years or decades. Near maximum brightness, the spectrum is generally similar to that of A or F giant stars. 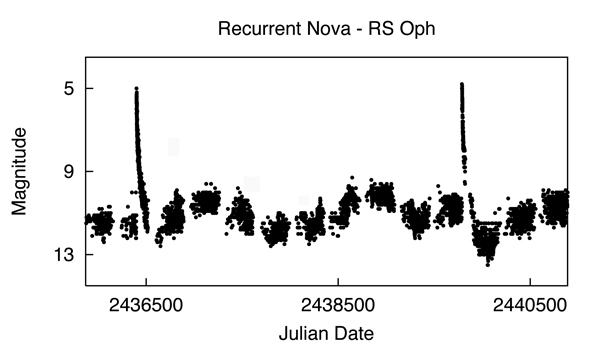 Recurrent Novae – These objects are similar to novae, but have two or more slightly smaller-amplitude outbursts during their recorded history. Dwarf Novae – These are close binary systems made up of a red dwarf–a little cooler than our Sun, a white dwarf, and an accretion disk surrounding the white dwarf. The brightening by 2 to 6 magnitudes is due to instability in the disk which forces the disk material to drain down (accrete) onto the white dwarf. 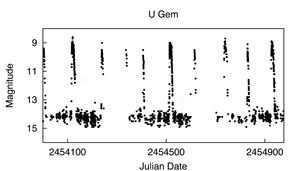 There are three main subclasses of dwarf novae; U Gem, Z Cam, and SU UMa stars. U Geminorum – After intervals of quiescence at minimum light, they suddenly brighten. 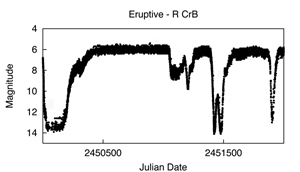 Depending on the star, the eruptions occur at intervals of 30 to 500 days and last generally 5 to 20 days. 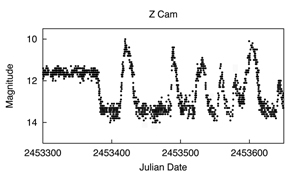 Z Camelopardalis – These stars are physically similar to U Gem stars. 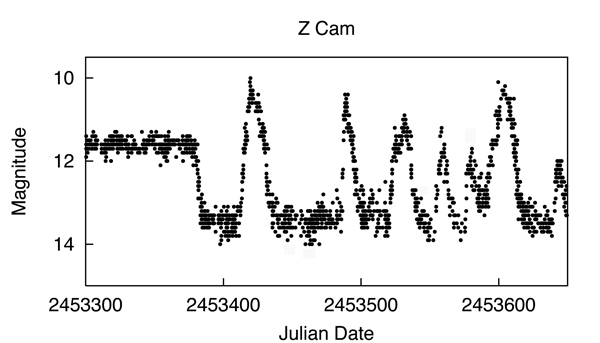 They show cyclic variations, interrupted by intervals of constant brightness called “standstills”. These standstills last the equivalent of several cycles, with the star “stuck” at the brightness approximately one-third of the way from maximum to minimum. 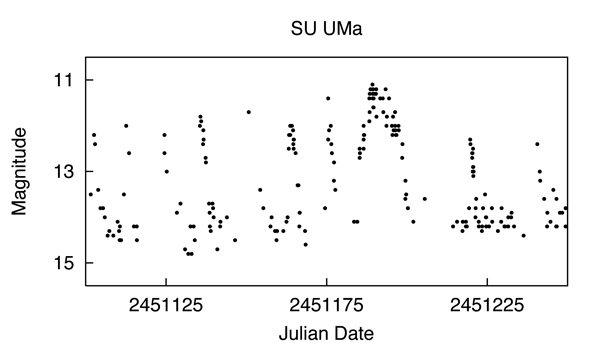 SU Ursae Majoris – Also physically similar to U Gem stars, these systems have two distinct kinds of outbursts: one is faint, frequent, and short, with a duration of 1 to 2 days; the other (“superoutburst”) is bright, less frequent, and long, with a duration of 10 to 20 days. During superoutbursts, small periodic modulations (“superhumps”) appear. 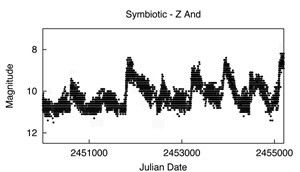 Symbiotic stars – These close binary systems consist of a red giant and a hot blue star, both embedded in nebulosity. 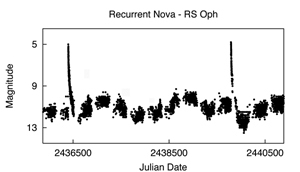 They show semi-periodic, nova-like outbursts, up to three magnitudes in amplitude. Eruptive variables are stars varying in brightness because of violent processes and flares occurring in their chromospheres and coronae. The light changes are usually accompanied by shell events or mass outflow in the form of stellar winds of variable intensity and/or by interaction with the surrounding interstellar medium. R Coronae Borealis – These rare, luminous, hydrogen-poor, carbon-rich, supergiants spend most of their time at maximum light, occasionally fading as much as nine magnitudes at irregular intervals. They then slowly recover to their maximum brightness after a few months to a year. Members of this group have F to K and R spectral types. These are binary systems of stars with an orbital plane lying near the line-of-sight of the observer. 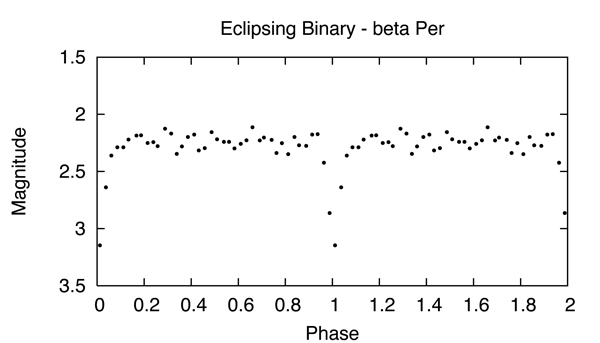 The components periodically eclipse one another, causing a decrease in the apparent brightness of the system as seen by the observer. The period of the eclipse, which coincides with the orbital period of the system, can range from minutes to years. Rotating stars show small changes in light that may be due to dark or bright spots, or patches on their stellar surfaces (“starspots”). Rotating stars are often binary systems.